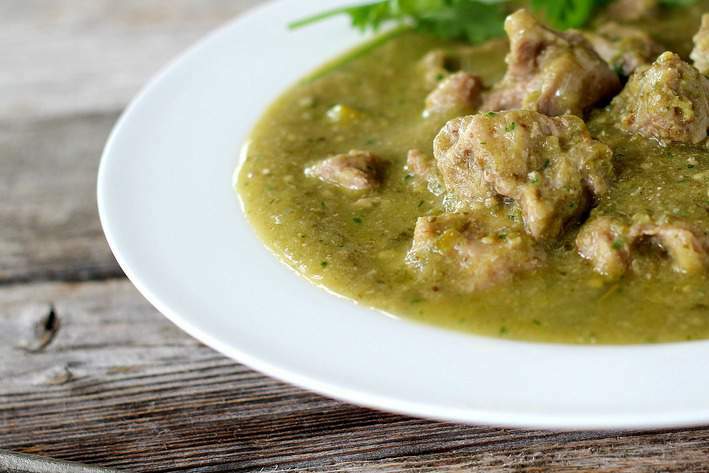 Chile Verde usually requires many steps to get it from prep to hot-on-the-table. But with an Instant Pot or other pressure cooker, all the flavors that usually take hours to come together are perfection in less than an hour. I’ve listed a good cross sampling of different peppers to put in your verde but you can play with some combinations to your liking. Look at these pretty, bright veggies. Onions, tomatillos, Anaheim and Poblano peppers are the base, and a couple chopped jalapenos, seeds and all (the seeds just add depth here, not a lot of heat). If you want a bit more heat, you can add some hotter peppers or extra jalapenos or serranos, which I did. I added a habenaro and serrano pepper to everything listed and it still wasn’t too much for the least heat tolerant in the house (that’s not me). One thing you’ll notice that’s missing from the list here is any extra liquid or broth before cooking. The pressure cooker infuses the liquid that naturally comes out of the vegetables so the verde is the perfect intensity of flavor with no extra liqud needed. Adding extra liquid is not okay for every pressure cooking recipe. 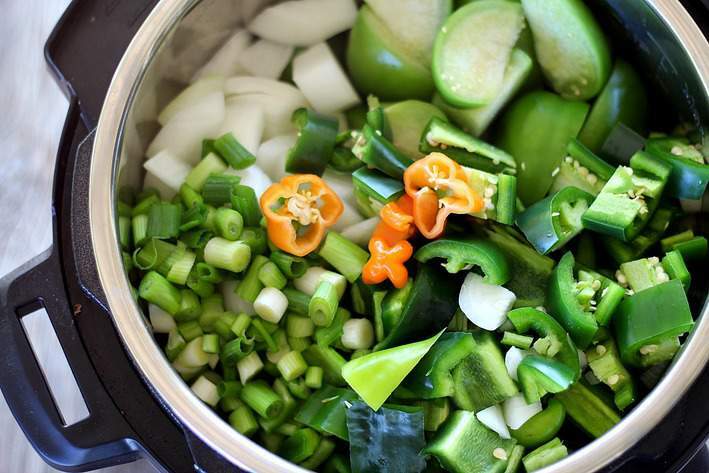 In the case of the Chile Verde, since there are a lot of vegetables in the stew, there will be plenty of liquid created by these vegetables. 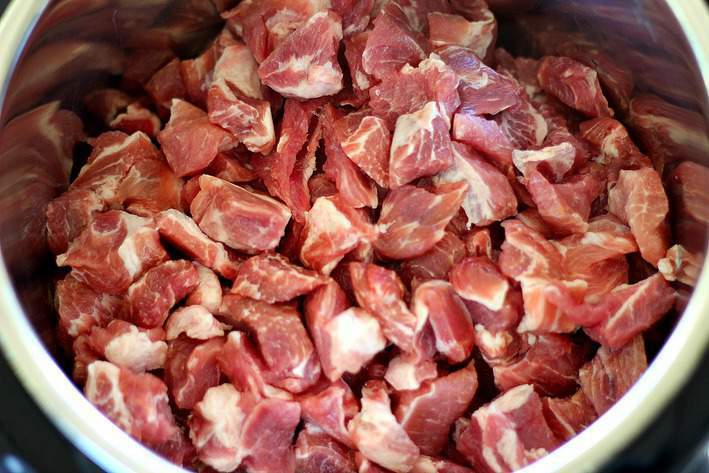 Four pounds of diced, well marbled pork shoulder, cut up by the butcher- ask them to do it if you can’t find it pre-cut. I like my pork cut into one-inch cubes. But at the end of cooking you need to remove the meat before pureeing the vegetables and liquid, so the smaller bites can take awhile to remove. The benefit to larger diced pieces of pork is that it’s easier to remove after cooking and before you puree’ the verde ingredients. Not a biggy and larger pieces can be shredded before serving if you like. I place the veggies on top of the meat, no need to stir it first. A few minutes of sauteeing everything in the cooker which will sear the meat on the bottom of the cooker just enough (still no stirring needed), then the lid goes on and time is set for 28-30 minutes. The Instant Pot will reach pressure quickly since there’s no added liquid and you’ve already brought the temp up a little with the pre-sear. Once the cooking time is finished, quick release the steam, remove the meat from the juice and vegetables, add a handful of cilantro, a little bit of fish sauce, which is the secret ingredient that adds a hint of umami flavor. After the veggies have been pureed, the meat goes back in and it’s technically ready to serve. 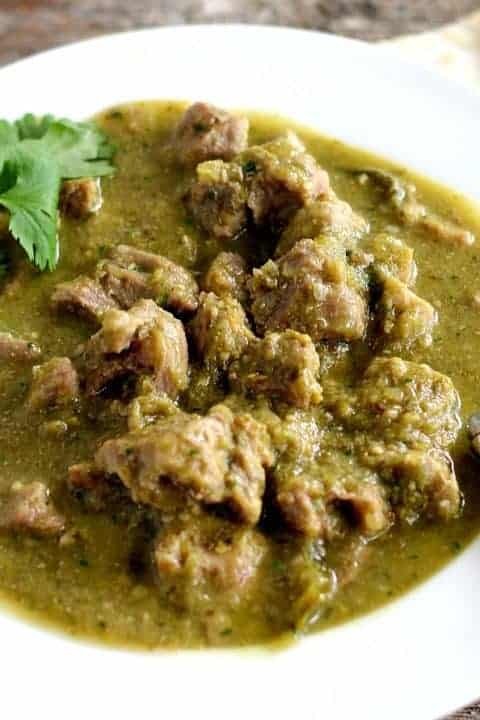 But here is a strong recommendation- If you truly want that amazing, favorite Mexican-restaurant-Chile Verde, place everything in a sealed container and let the Chile Verde continue to meld in the fridge for at least one day, and if you can stand to wait three days, it’s magical perfection. My brother makes a delicious long cooking Chile Verde and it’s always a good option when you have all day and feel like slowly creating and playing in the kitchen (like on a stormy Sunday). I used his recipe to pump up the flavors even more and I’ll post his method soon. But since I recommend making this dish a few days ahead of serving, can we truly call it a “quick” recipe? I say yes because if you plan accordingly, you can make this beauty in no time on a Wednesday night, then come Saturday evening after a day of housework or yardwork (ugh), or how about shopping, hiking, skiiing, lounging (yes! ), you can pull this finished dish out of the fridge and while it’s reheating, warm up some corn or flour tortillas, crumble a little cotija cheese or even feta or cheddar. 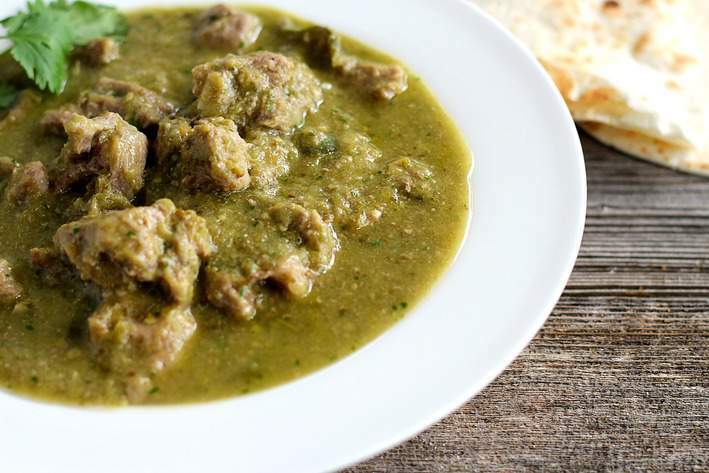 This is now my favorite way to make Chile Verde and I don’t know about you but having some of this finished and frozen at all times seems like a super good thing to do. Enjoy friends, and thanks for stopping by. Hope you give this a try soon. Let me know what you think! 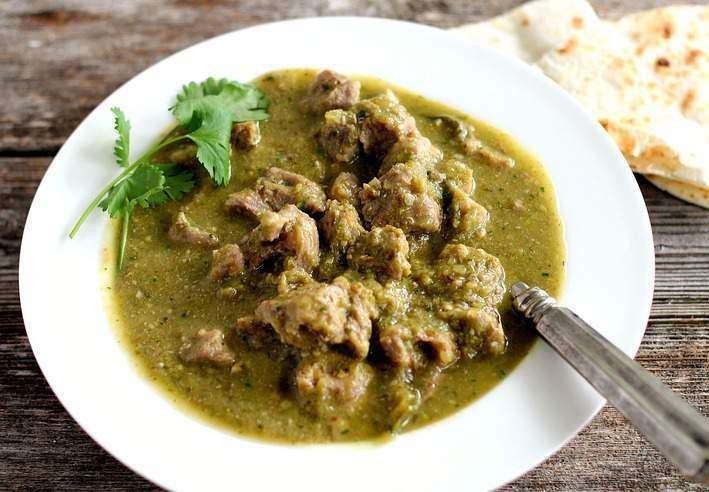 Truly the easiest Chile Verde recipe, you will get fabulous flavor here and all you do is chop the ingredients and dump them into the pot. No need to roast the vegetables beforehand. 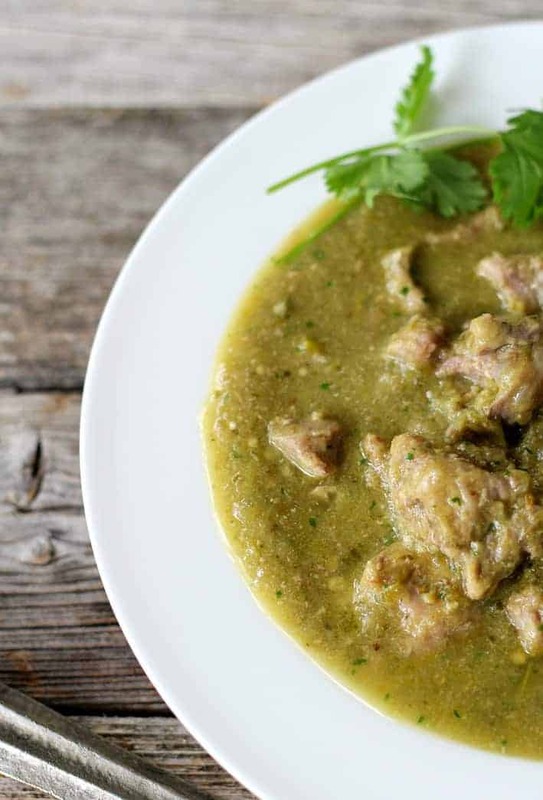 And though this recipe is ready in less than an hour, I highly recommend you let the completed Chile Verde sit in the fridge at least overnight but seriously, if you can make it two days ahead of serving, this will rival any authentic Mexican restaurant's Verde. Heat heavy bottomed pot to medium-high and add cumin seeds. Heat until seeds start to brown and become fragrant (watch to prevent burning), stirring occasionally. Remove from heat and allow to cool. Grind in an electric grinder or by hand with a mortar and pestle (that is method I use). Set aside until needed. In an Instant Pot or other stove top pressure cooker, combine pork, tomatillos, Pablano peppers, Anaheim peppers, jalapeno or serranos, onion, garlic, oregano, cumin, and salt (also add the habanero pepper and additional serranos if you want added heat). Press Saute button (for Instant Pot), then adjust to High. Heat until gently sizzling. Now place lid on cooker, select Manual button/High Pressure, Sealing function, and adjust time to 28 minutes. Once High Pressure cooking time is up, release pressure with Quick Release method. Using tongs, or slotted spoon if pork pieces are small, transfer pork to a bowl and set aside. Add cilantro and fish sauce to remaining contents in the pressure cooker. Blend with an immersion blender or in a countertop blender, then season to taste with salt, about 1 1/2 teaspoons. Return pork to the sauce and stir gently to combine. Serve immediately OR better yet, cool and place in 6 quart container with lid and keep in refrigerator for up to 3 days, at least overnight. Reheat over medium heat on stovetop and enjoy. The 15 minute prep time indicated in the recipe is with the assumption that your meat is already cut. I always ask the butcher to do it and some stores have pre-cut pork shoulder for chile verde already in the meat section. If you're cutting your own meat, allow another 15 minutes for this step. If your pork is cut in small pieces to begin with, the step where you remove the pork from the vegetables will be a bit tedious. If you're not wanting to be patient with this step, you can cut the meat into larger pieces to begin with and then cut them down more after they're removed from the stew prior to blending. Recipe adapted from Serious Eats via J. Knji Lopez-Alt of The Food Lab. Thank you for the recipe. I’m new to the Instant pot family, but love finding so many easy time saving recipes! My question is: have you tried to find an easy way to Pre-separate the meat and other ingredients “While cooking”??? Can you brown and put the pork in cheese cloth then load the other ingredients on top to cook? Then separated and blend the ingredients and return the meat to the blended liquid? Hi Gracie, I like your idea. I think it would work well. I try to just cut the pork bigger sometimes and then they’re less to remove. Then I cut them smaller and return at the end, but I think your idea would be better. Good luck with your new Instant Pot! 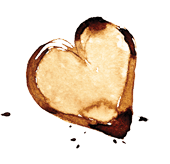 You will love it and thanks for checking out my recipes. Can I leave the pork out to make this vegitarian? This was absolutely amazing! I made it exactly as recommended and it turned out awesome. Thank you!! Why the yellow bell pepper? Hi Pam, I use a variety of peppers because I think it adds to the complexity of flavors. Yellow peppers are a nice, floral type pepper. You can certainly use your own preference of pepper combinations. Oh my gosh! I was so nervous about this one!! I got to taste it before I attempted to make it myself and loved it! Today, I made it and…. woohoo…it tastes like it’s supposed to!! My daughter and her friend loved it. I’m so excited to take this into work for a potluck on Friday. I was told to make it today for max flavor on Friday! Easy to follow directions!! Thanks, GDM! You are awesome, friend! I could not be more proud of you… actually yes, I can. I am more and more proud every day for every reason you know. Good job! I see some green onion in the third photo but not in the recipe. Different recipe or secret ingredient? Just want to make sure it’s a success! Hi Mark, I’ve made this recipe with and without the green onions so forgot to add it to match the recipe. Thanks for the catch. I just went in and added them to the ingredient list. Let me know how it turns out for you. Oregeno is listed as an ingredient but not used in recipe. After 28 minutes on high saute in InstaPot, 1.5″ cubes of pork shoulder were still pink and rubbery. Added a 12 minute high pressure cycle and it was perfectly fork tender. Fish sauce is a brilliant addition. Taste profile is spot on. Hi Robert, Thanks for the catch on the oregano. I meant that you should cook on high pressure for 28 minutes. The saute is just until sizzling begins so obviously I wasn’t clear on that. I’ve since gone in and added more specific instructions. Thanks so much for your comment.